If someone had told me I’d write 200 blog posts about building a few years back, I would never have guessed it, but here we are. This is published post #200! To celebrate the meaning of this, I am introducing my second build for the year that will run in parallell with Dark Helmet. 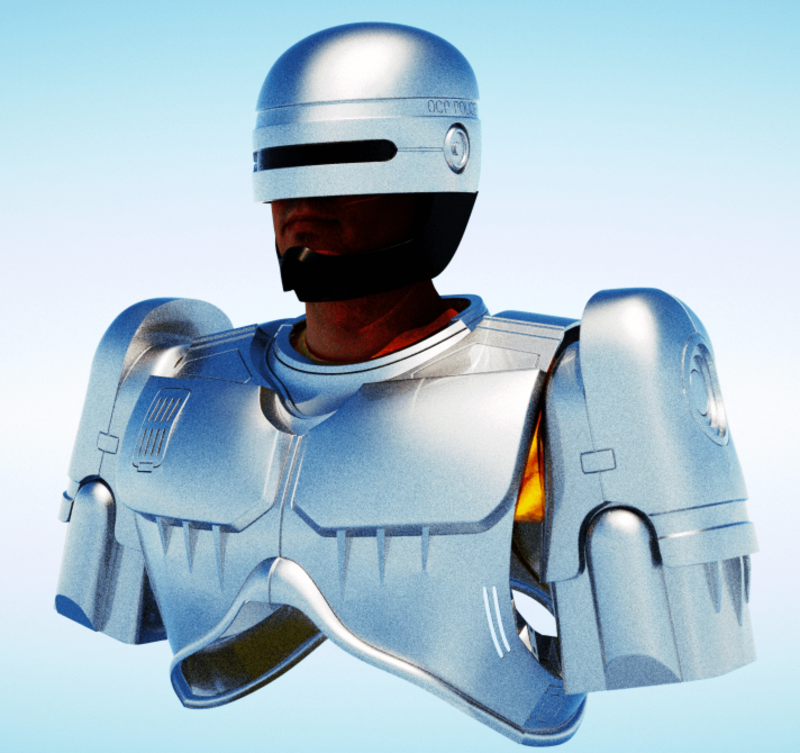 It is the one and only, the iconic hero from Chicago and Delta City… Robocop! After looking around, it was difficult to find some good resources for Robocop. 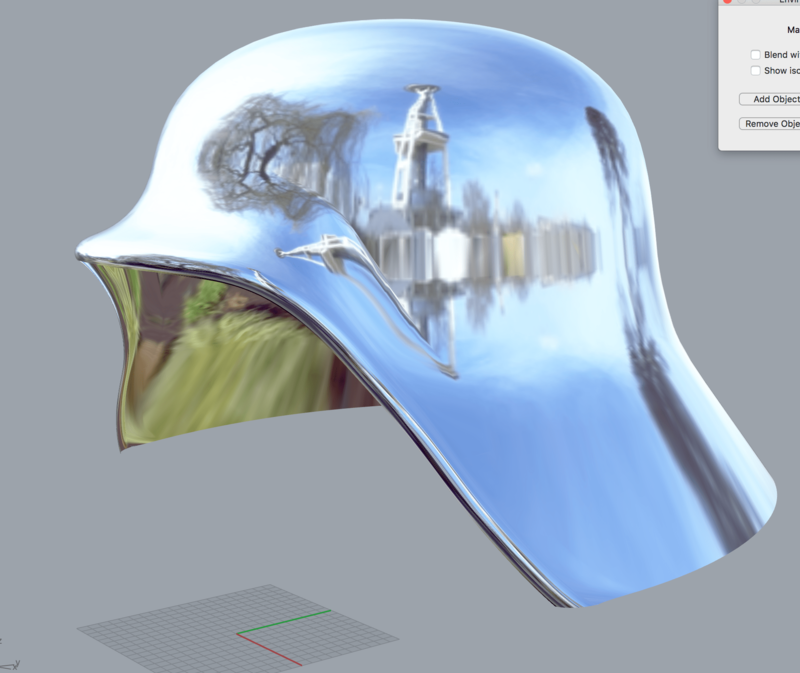 I also tried sculpting the helmet myself in Rhino, but my skills are noat at speed with making more organic shapes, so I gave up on making it myself. 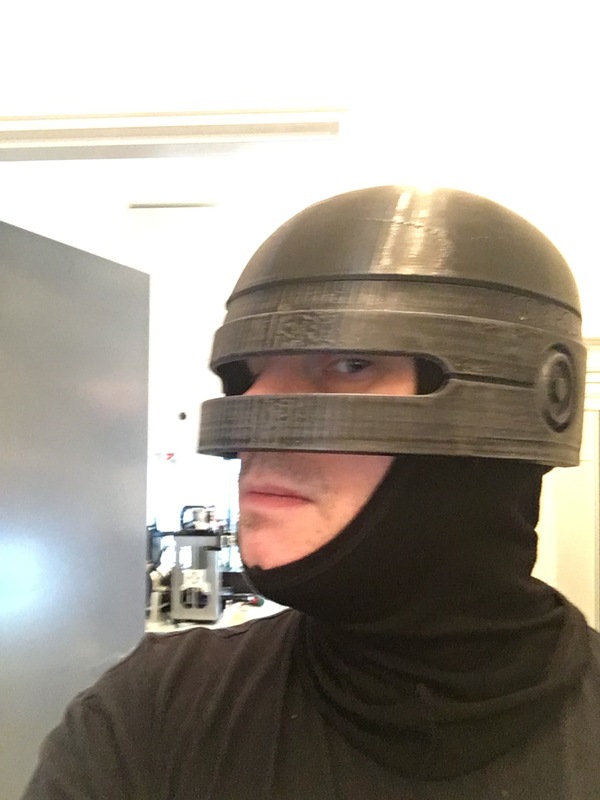 However, I did manage to find a decent looking Robocop costume for 3d printing by do3d. 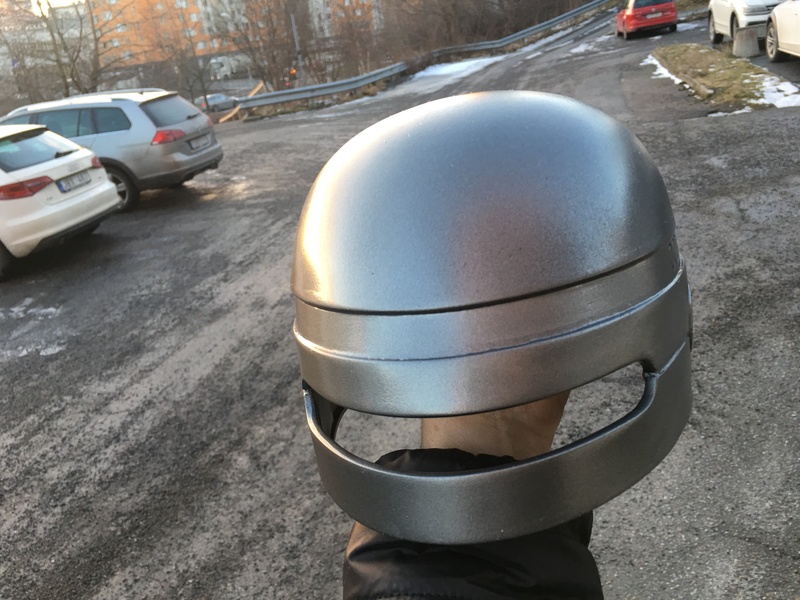 Sure, the costume will need a lot of work, and has several details missing, but it is a very good base to start building a Robocop costume from. 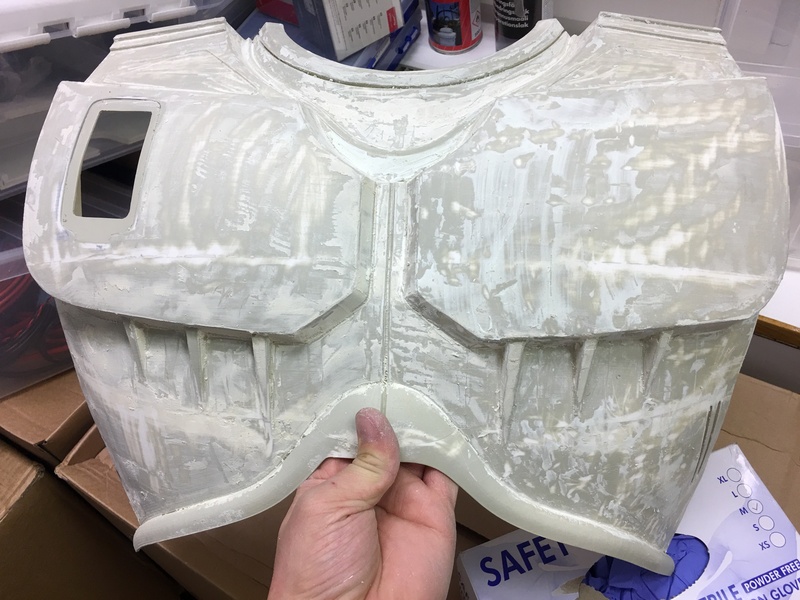 My goal is, as usual, to make it as screen accurate as I can, and this mean, in addition to the normal sanding bondo sanding putty sanding cycle, I also need to add quite a bit of building to the project. I might scratch build some things, other things I might be able to fix in 3d. The biggest issue is that to change an .stl file, consisting of tens of thousands small triangles is extremely resource heavy and is almost crashing my computer when trying, so if I need to remake some parts (and I already have) I can really only use the existing files as a base and take measurements from in order to make a more screen accurate model. 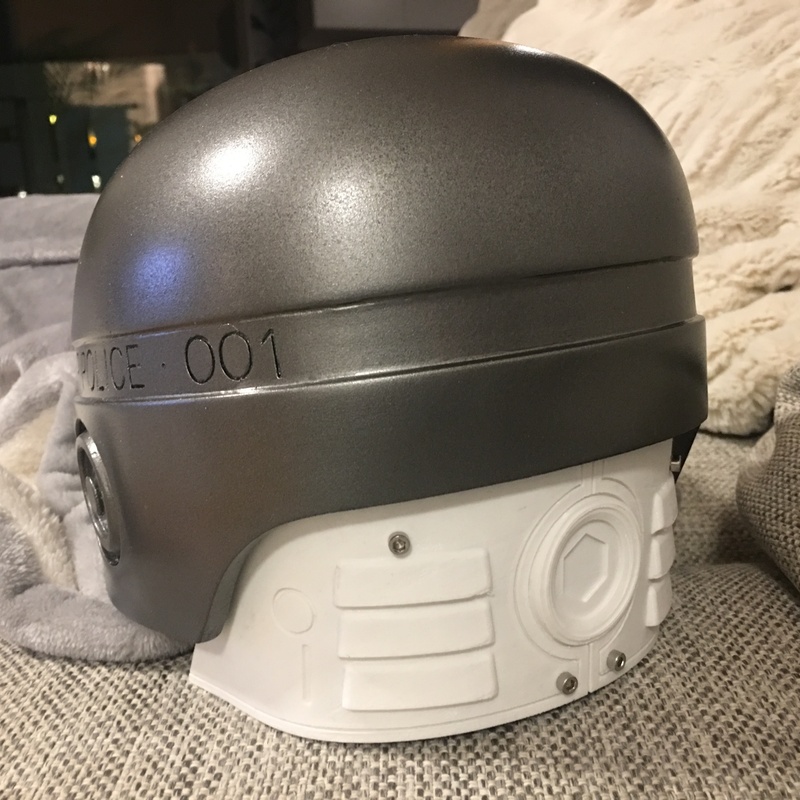 First off, I simply HAD to print the helmet! To be honest, it looked a bit dodgy. This helmet really needs the jaw! 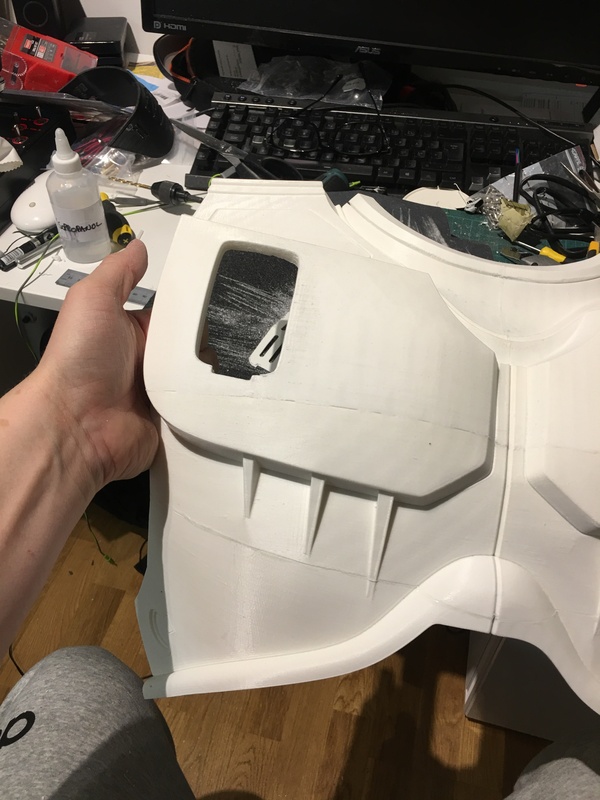 Once the jaw was printed, more test fit, and it looked better already! From looking at the movie, I would guess that the jaw is made from silicone or other soft rubber. 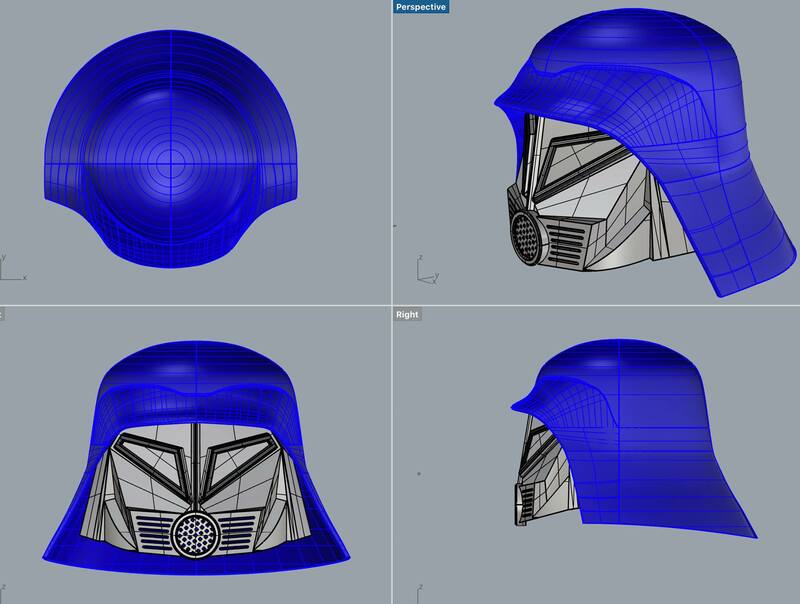 I have some ideas to cover the 3d printed model with the same fabric used for my Dark Helmet cape and shorts. It is shiny and has a plastic coating. 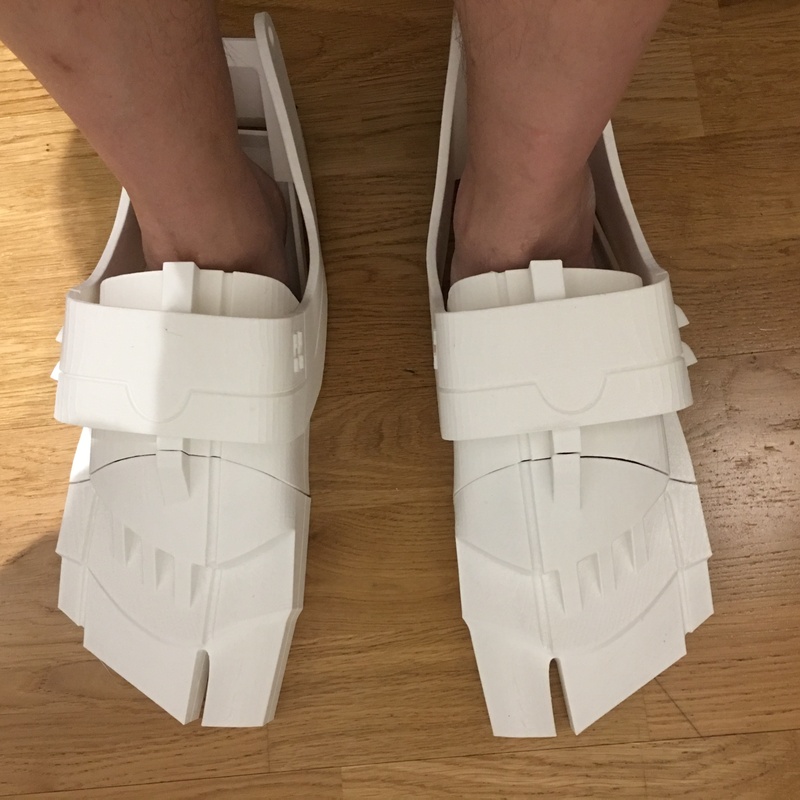 Another idea is to make the jaw piece out of EVA foam to make it more flexible. 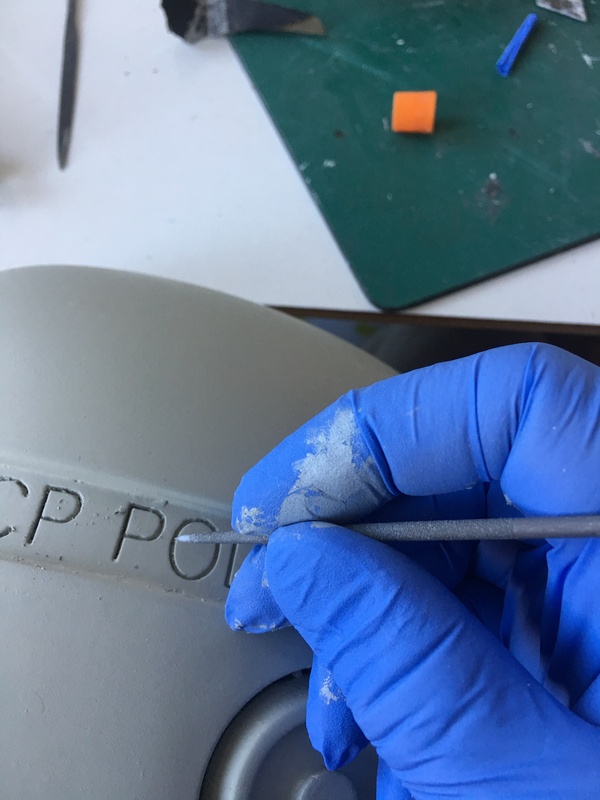 During this process i used a needle file to clean up the lettering inbetween every spray filler/bondo/sanding round. I finished off the base by painting the helmet black. and then another turn of sanding before painting it in a metallic grey. This colour turned out to be a little too dark for the look, but it was a paint test after all. Once painted and clear coated it looked pretty sweet, but wrong. So, I have a helmet that is working. Next up was the neck piece. The neck piece modelled by do3d is ok, but lacks some details and have some things that are wrong. 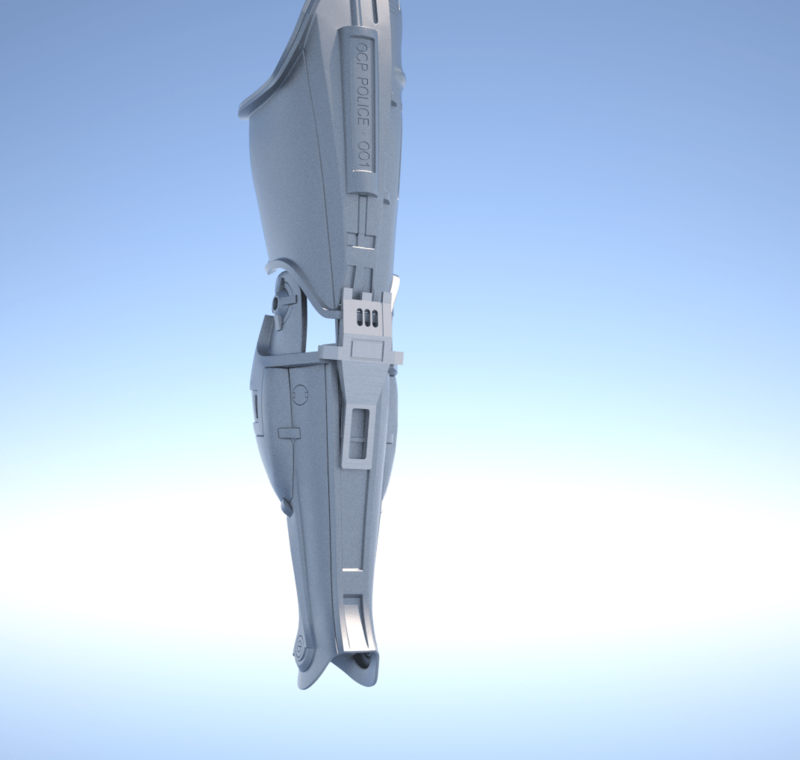 Since this was a rather small piece, I tried my hand at 3d modelling this from scratch, and came up with a version I am much more happy with that has more details and even functional neck vents. 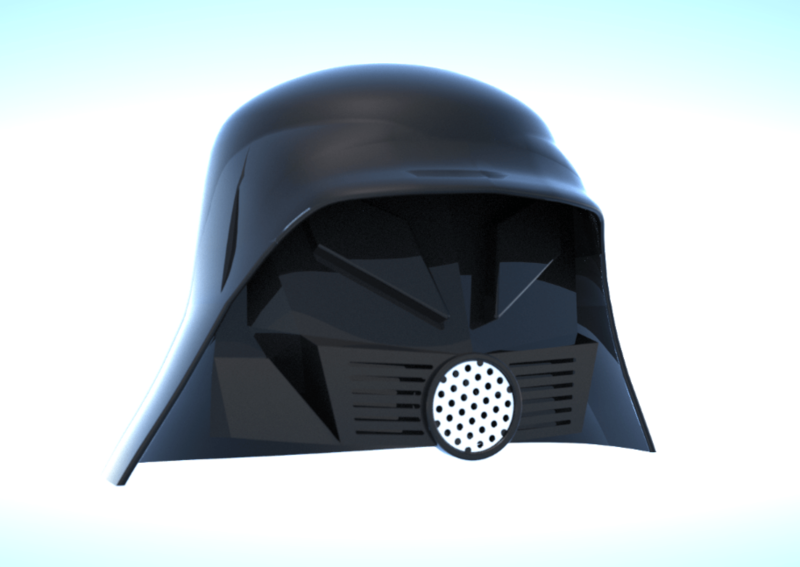 In the process of doing this, I also remodelled the ears of the helmet for more screen accurate versions. 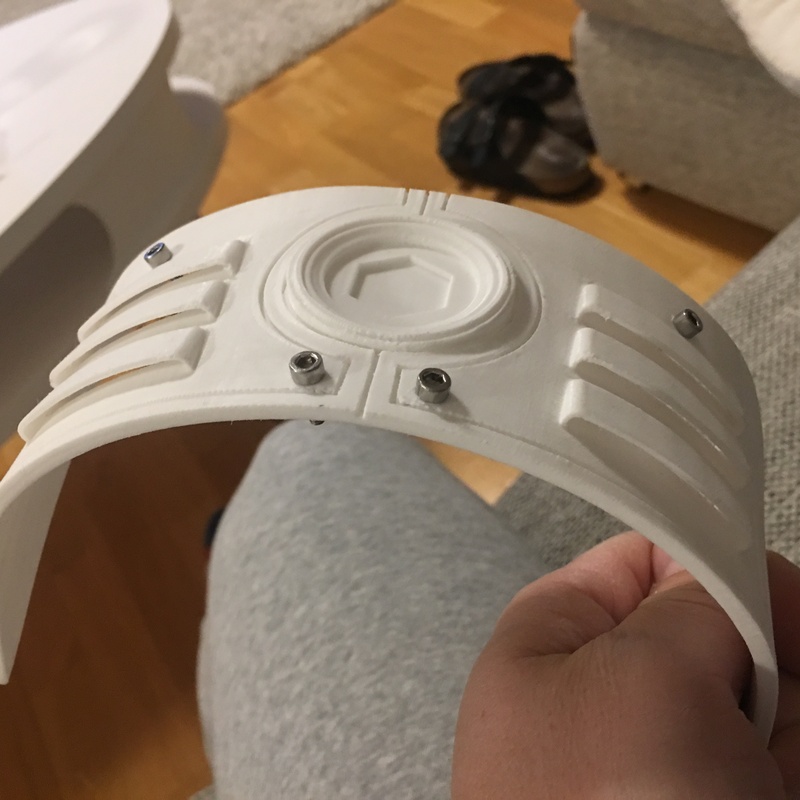 My first attempt at printing the chest piece did not work out too well. 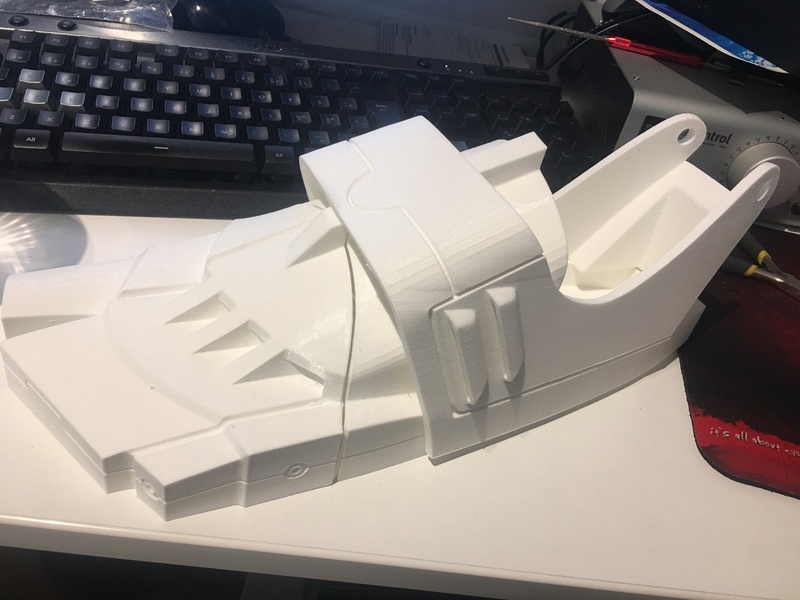 I printed it to about 75% before I realised that I had scaled it slightly wrong. It would have been too large and made it impossible to move my arms. My bad. 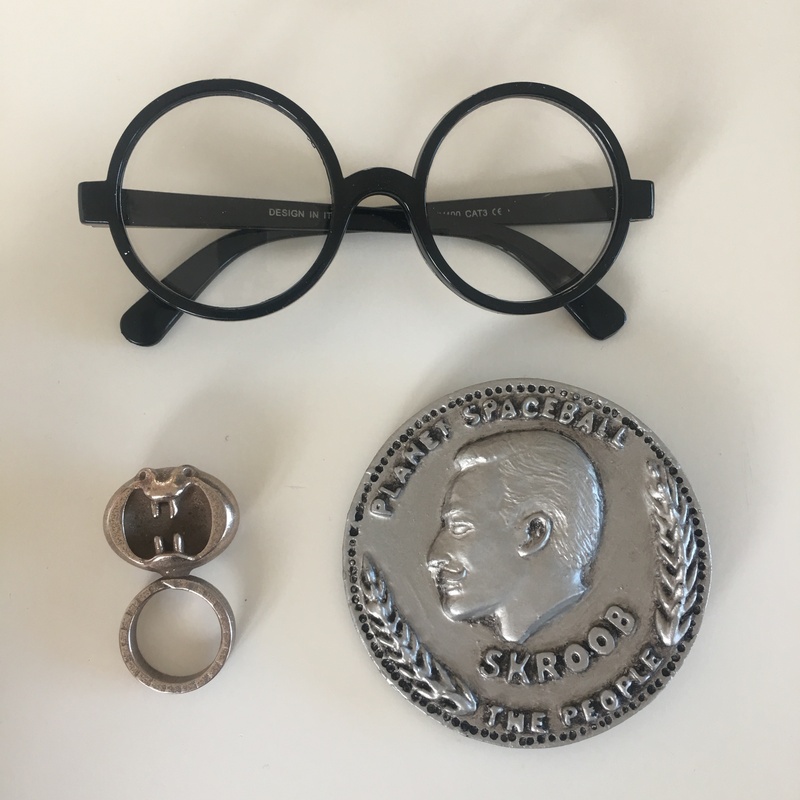 I had scaled it up 5% since I thought it was too small and made an error in measuring the piece. 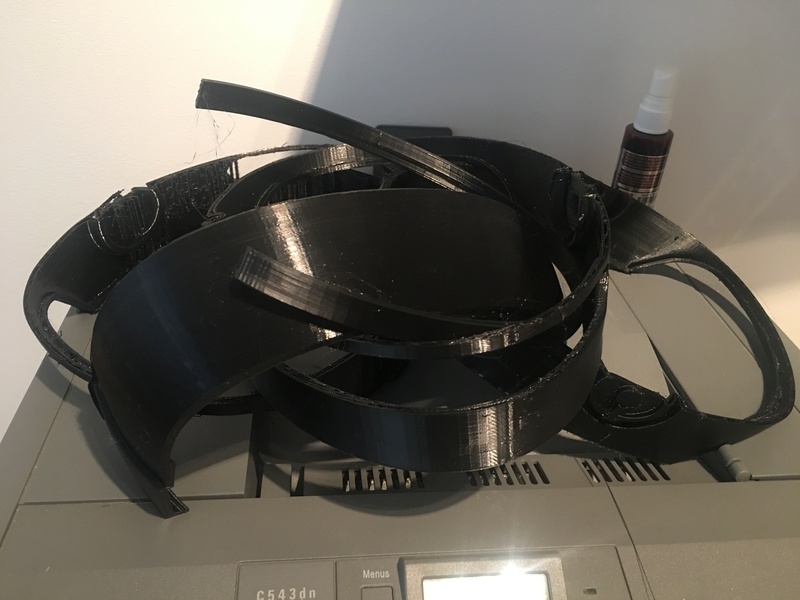 A lot of prints have gone into the scrap pile so far. But I’ve managed to get a chest piece done. 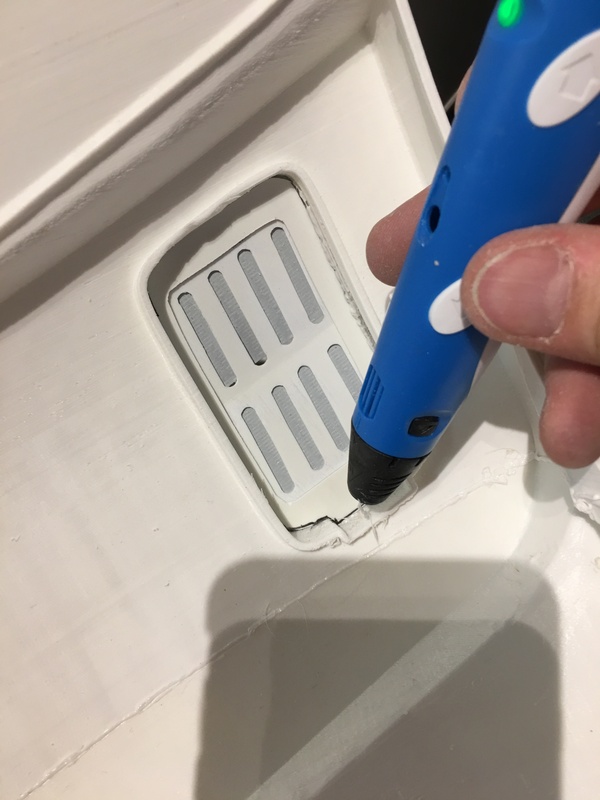 I also removed the existing vent and scratch built a more accurate one from some scrap styrene I had laying around. 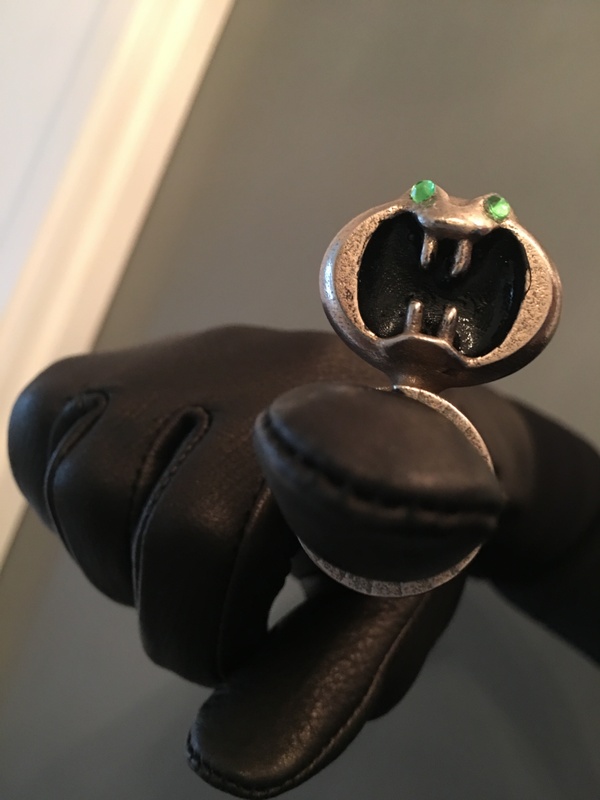 It was glued together with superglue to hold it in place, and welded with my 3d print pen. It is holding together really well using this technique. A little bit of bondo and the chest is done. 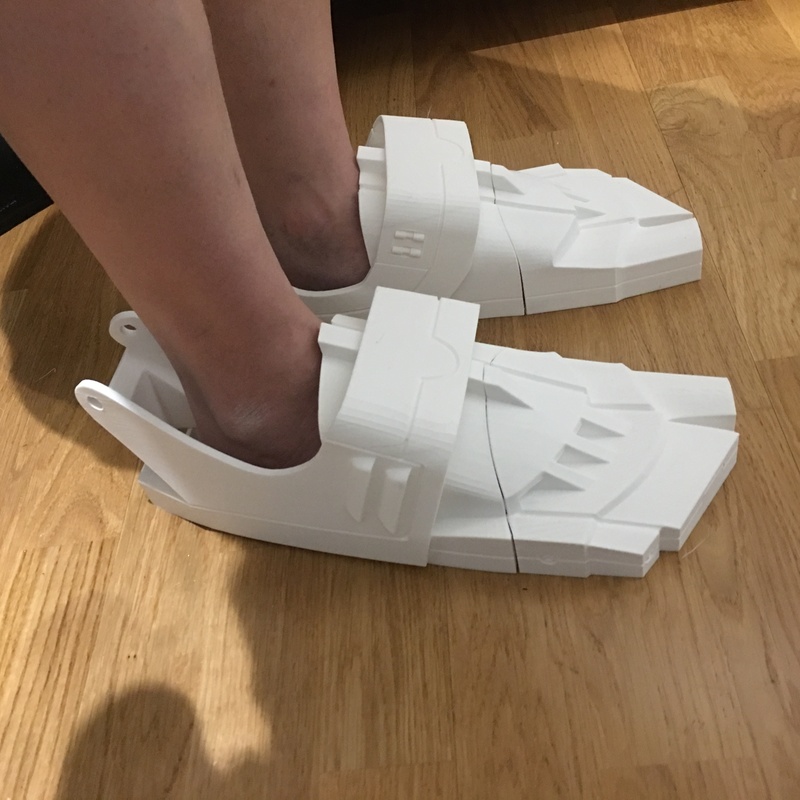 The feet are also printed, but needs modifications. 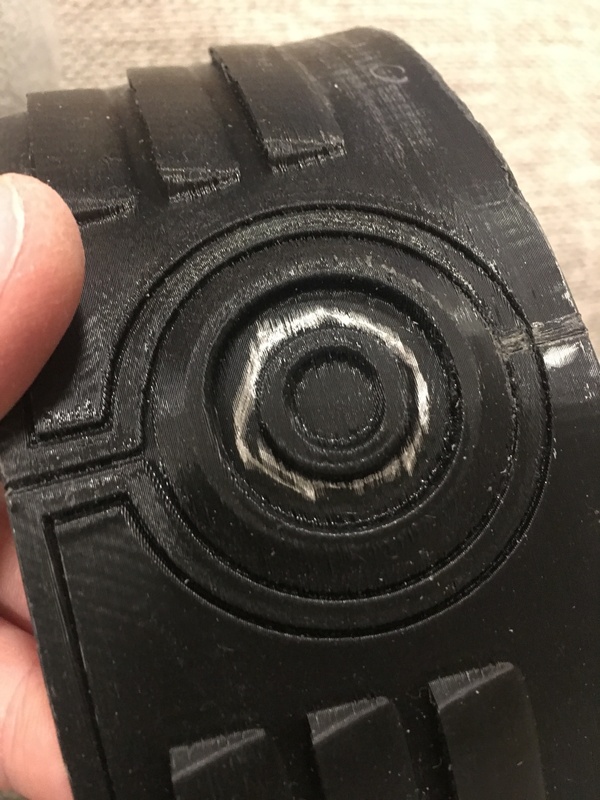 The screen used feet have a half circle cut out in the top of both parts laying on top of the foot, making it a lot easier and comfier to wear. 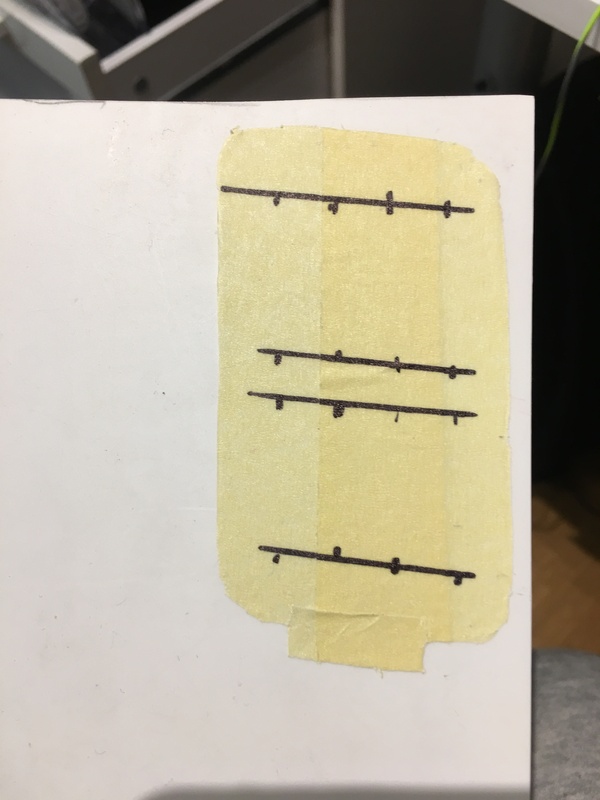 So far, I have not cut that out. The legs is another chapter. Not only are some details wrong, some details missing, but they will also need major modifications to be able to wear them! For starters, my legs, my calves have muscles. I can not wear them around my ankles as they are without expanding them. In addition, there is detail that needs to be added, and I fear the legs will be a lot of work to make wearable. 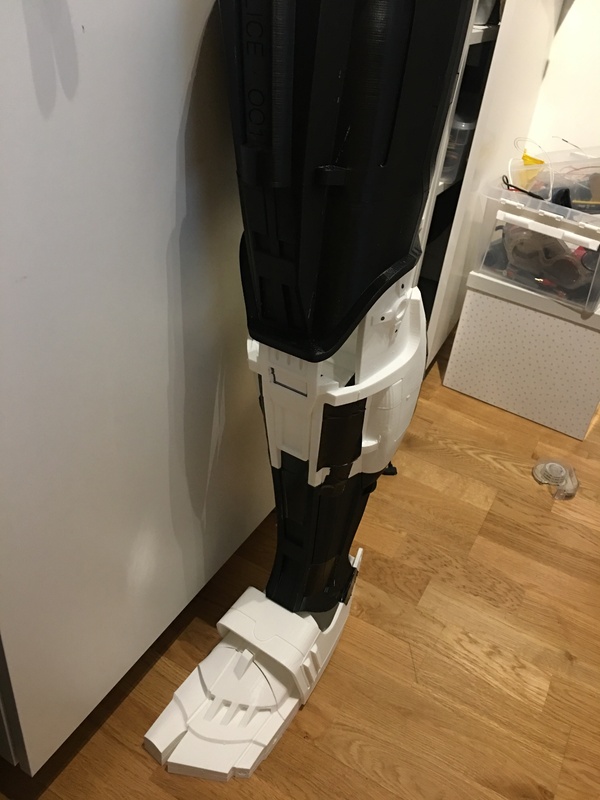 For starters, the knee plate should be a lot larger and stick out outside the knee. 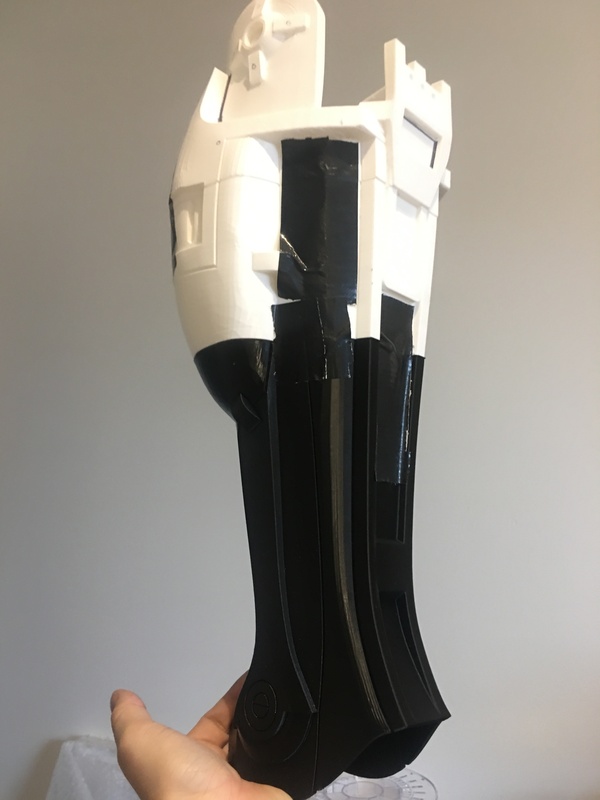 I made a mockup in Rhino where I modelled a new, larger knee plate that matches up the screen shots better and just placed it outside the original to get a feel for it. Looks pretty good, I think. 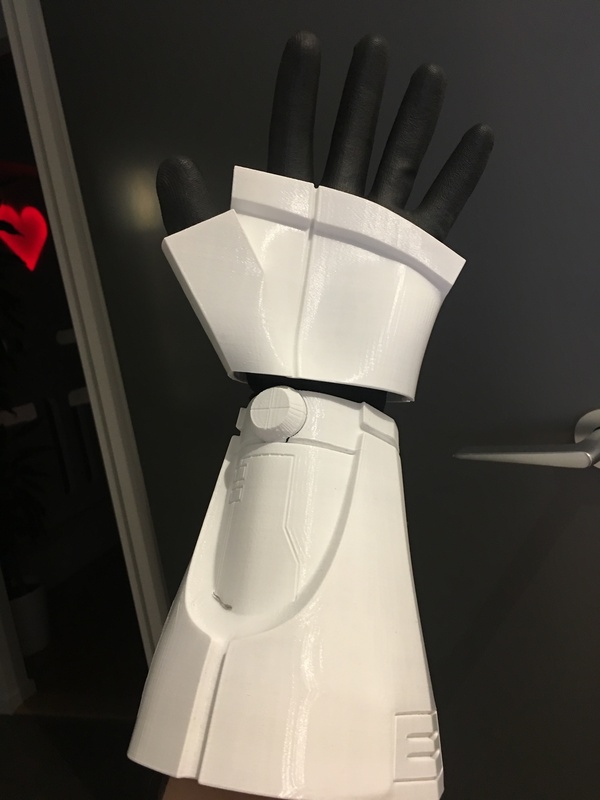 Next thing to print and scale was the gloves. Turns out the gloves were about 60% of the scale they should be. 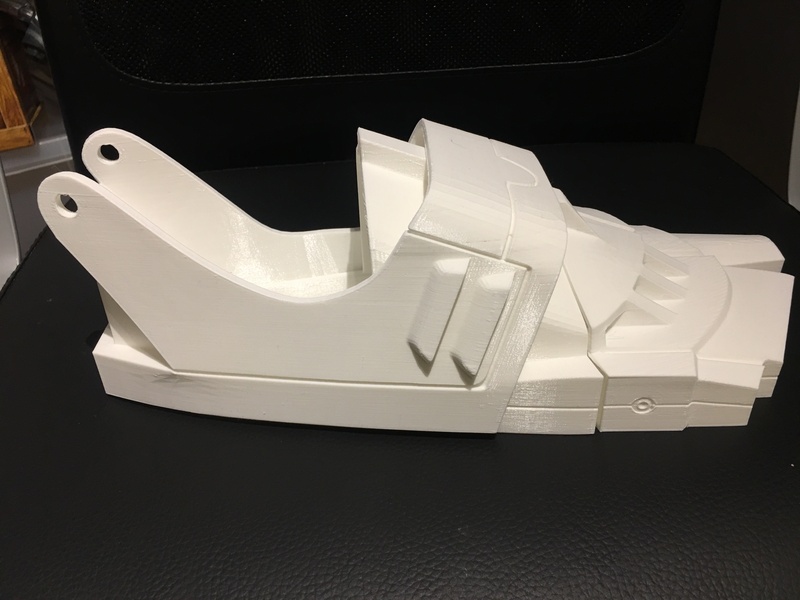 After printing out the first forearm and seeing how tiny it was, it was time to scale up the prints. 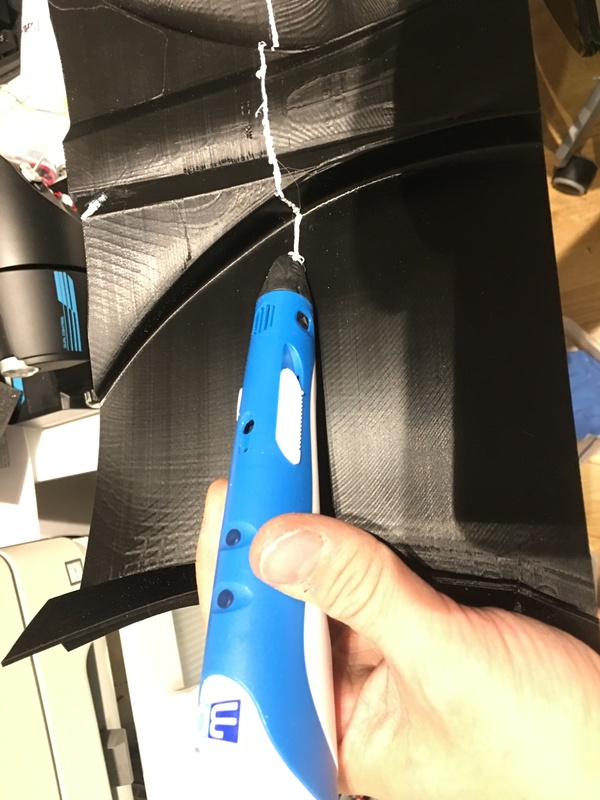 I still think the glove is a bit too large, and I may need to print it in flexible filaments, but that is something I will experiment with. 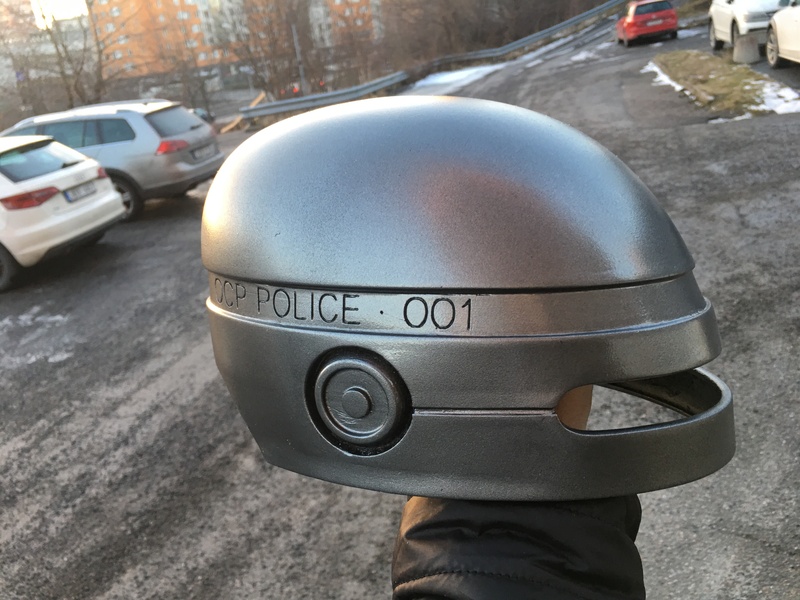 By micke|2018-02-24T08:08:14+00:00February 24th, 2018|Costuming, Robocop|Comments Off on 200 posts! Time to launch the Robocop Project! 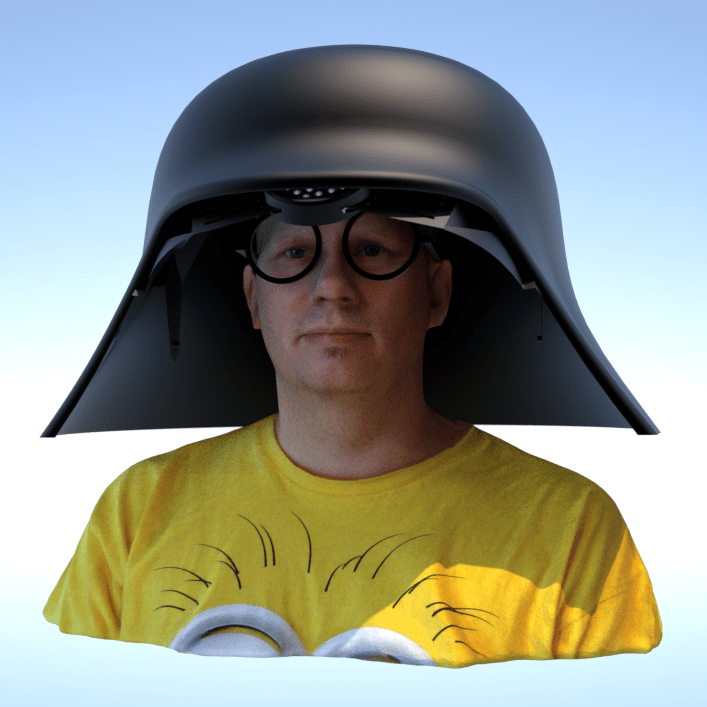 Since I decided (wisely so) that I was too short to do a credible Darth Vader, I settled on the second best: Dark Helmet from Spaceballs! I figured Dark Helmet would be easy, a fun character, plus I get to wear my glasses underneath the helmet and actually be able to see! To me, the process started with the most iconic piece: The helmet! 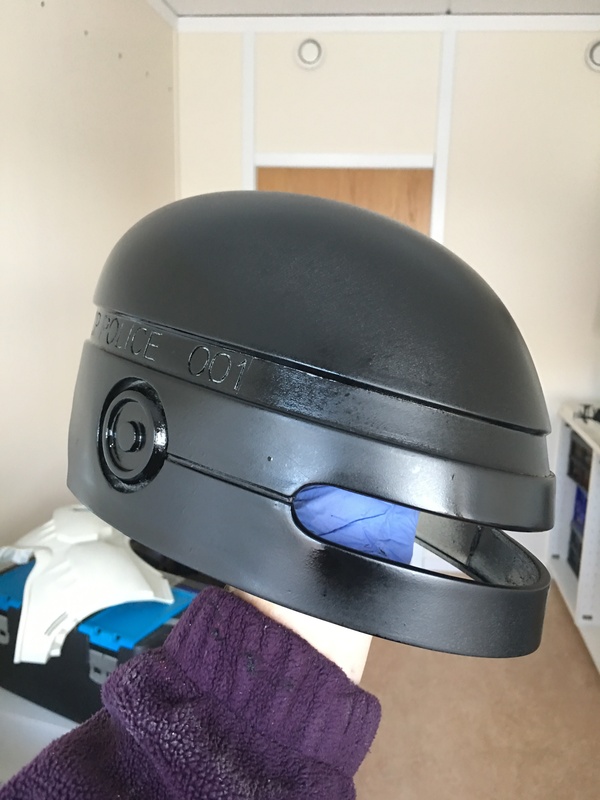 I searched the internet high and low, and found no one that (still) makes a decent looking helmet, so I started to make my own. 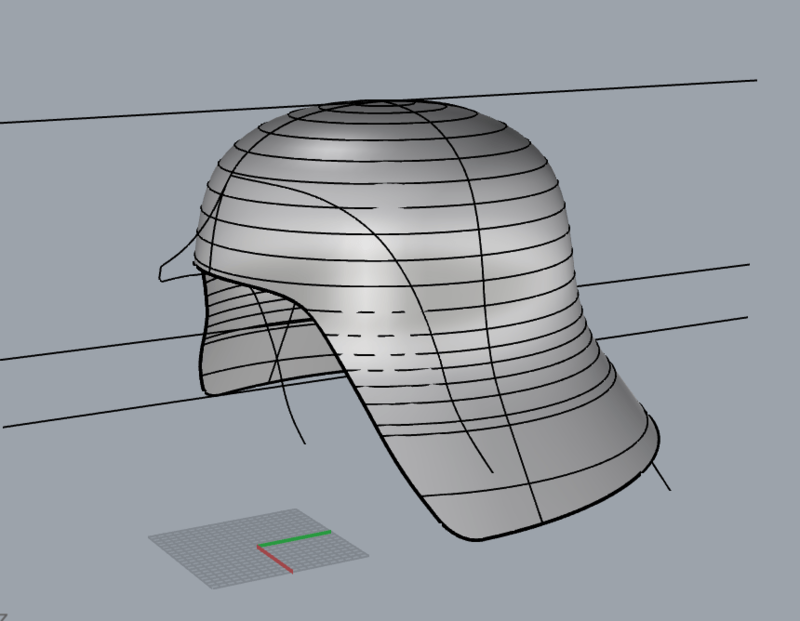 Armed with a bunch of reference pictures and screen shot, I went into uncharted waters with rhino3d, and tried to make a simple helmet. 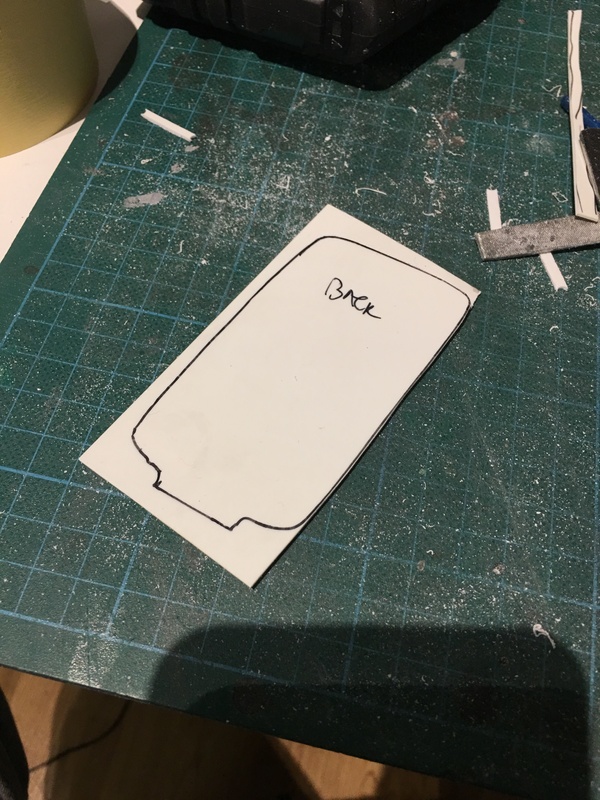 Getting the base shape was easy. 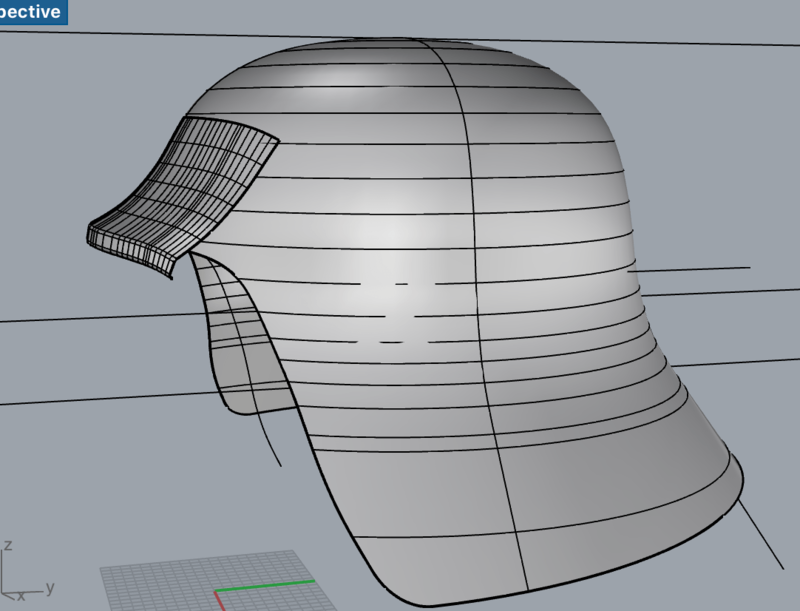 I had the lines of the shape ready, but had no idea how to actually make the cap. All attempts made only made it look wonky, and I could not get the shape right, and the transition was not smooth enough. It looked *wrong*. Eventually, after looking at a few various instructional videos, I found a command I’ve learned to love: Blend Surfaces! 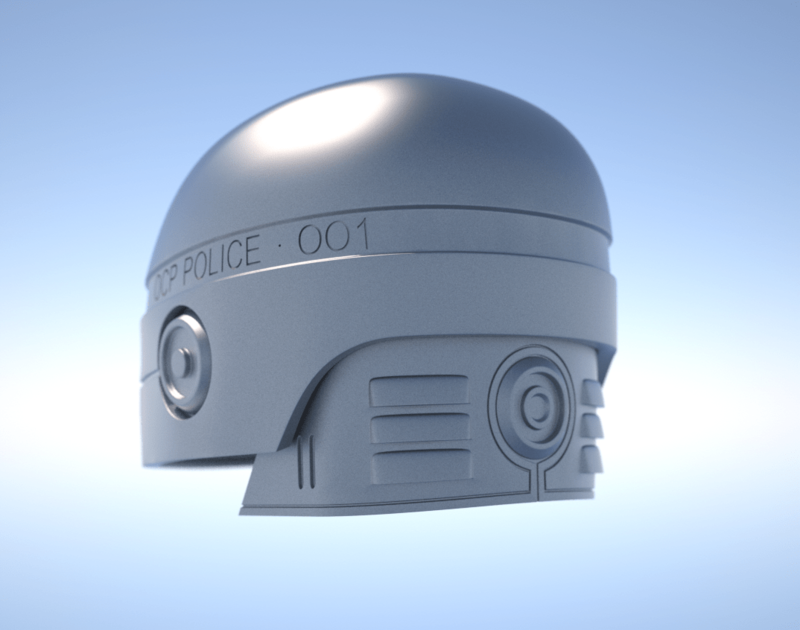 I made the edge of the cap and the base helmet, and had the middle area, the curved area, controlled by the blend. All of a sudden, I managed to get the curve smooth and not look wonky! 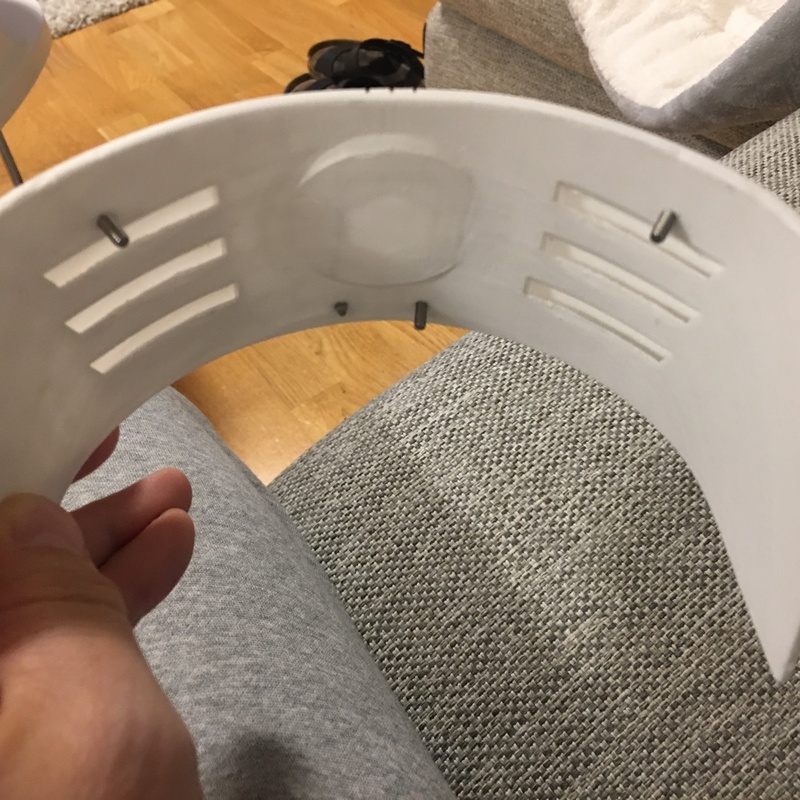 Of course, my mask will be able to flip up into the helmet..
As the 3d design part took time, this was after all a project I left and came back to under several months before reaching the final design for the helmet, I also started making the soft parts. 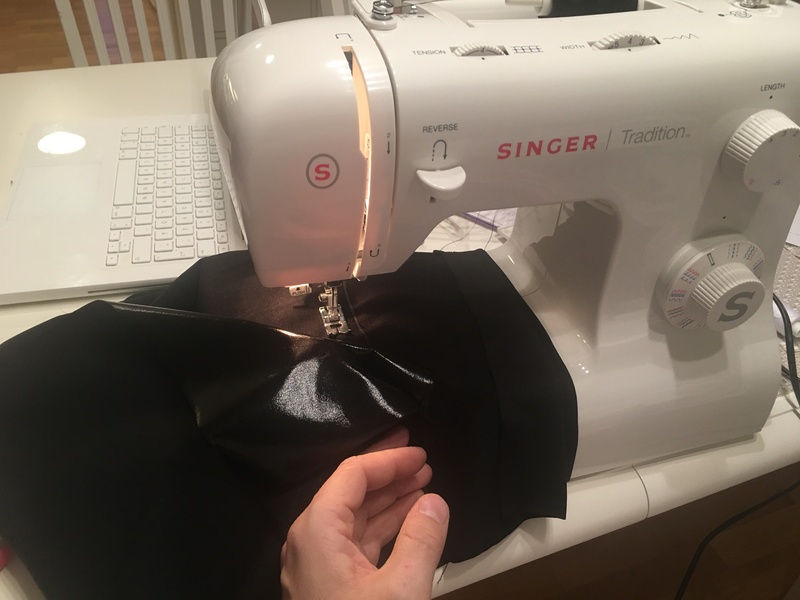 First off was sewing a cap in a very slippery and shiny material. 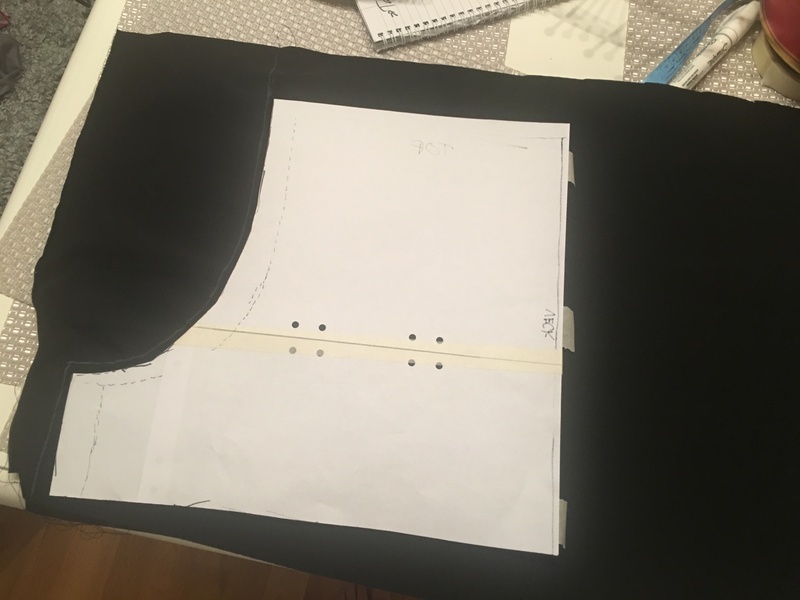 I also learned how to sew a pair of shorts, and made the base shape of the shorts for my Dark Helmet. The rest will be made once I have fixed the black tubes that goes around the shorts. 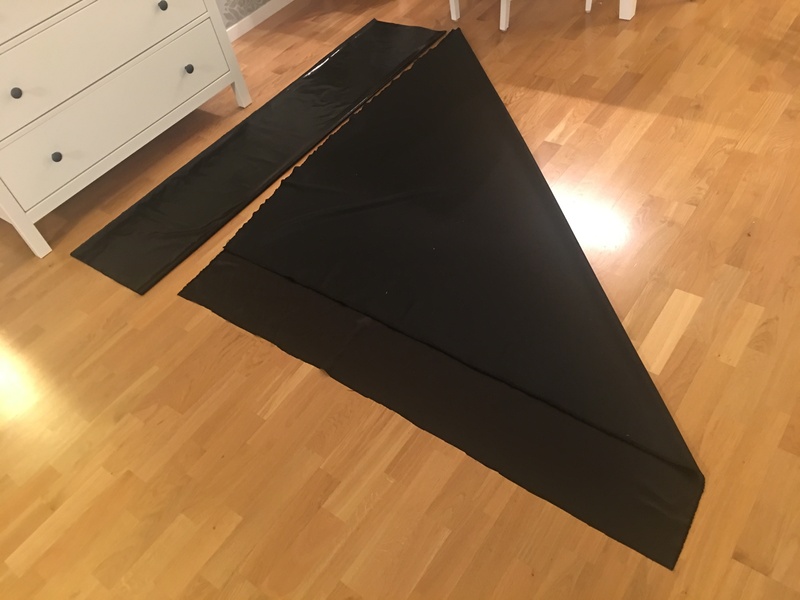 I made a pattern based off a pair of gym shorts, made a pair in a cheaper material, turned out they were too small and modifications were made until I made a pair in the shiny material. These shorts will also be quite short, but I figured I’d spare you this .. for now. I have also bought a black lycra training undergarments that will work great for the main suit of Dark Helmet. I still need to design the shoulder area and make the neck, attach to the cape, 3d print a lot of black pyramid studs and fasten on the arms and gloves and find a good looking boot to go with the outfit. 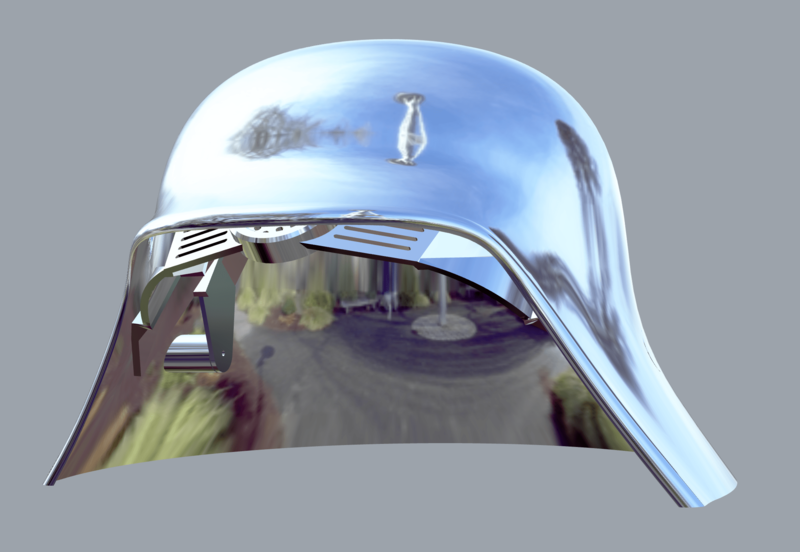 But then there’s the helmet. What I started with is almost left to the end. 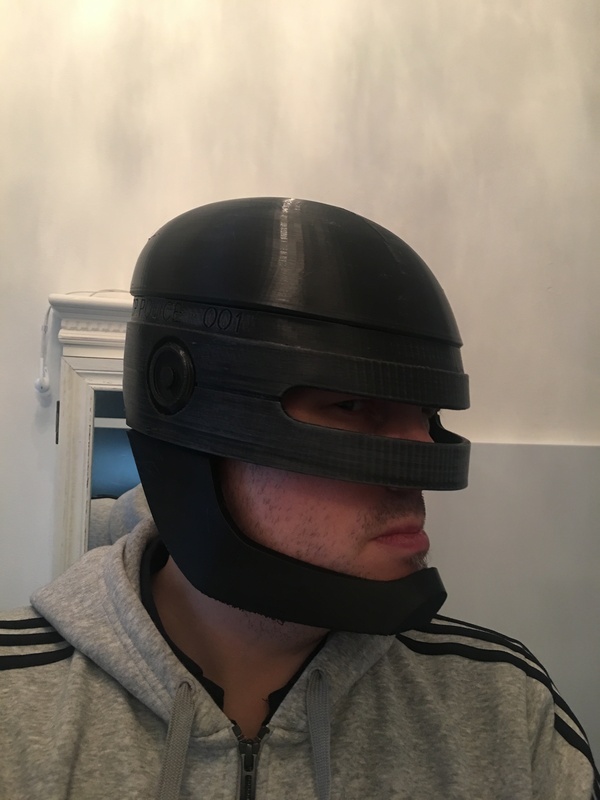 I started 3d printing out my last version, realised the helmet were going to be quite heavy, looked over it again, and saw that I had printed it 25% too large! 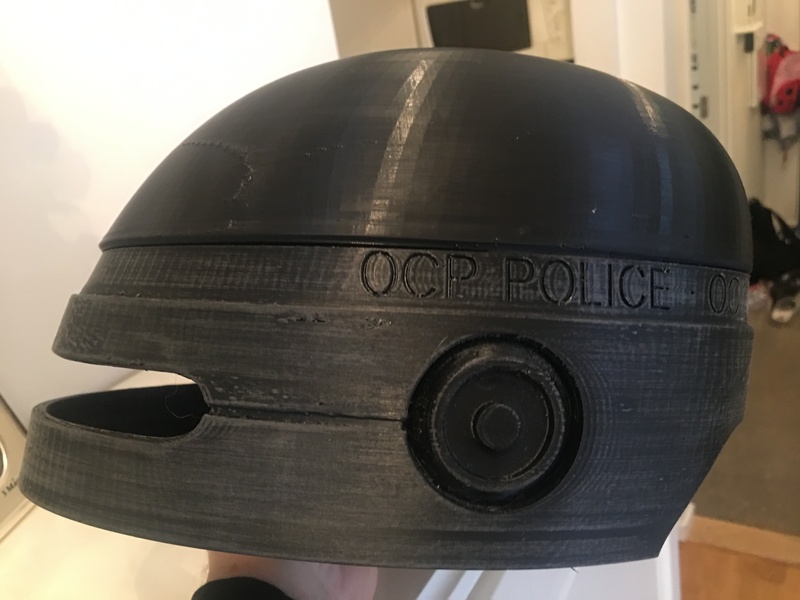 I had printed about 70% of the helmet. 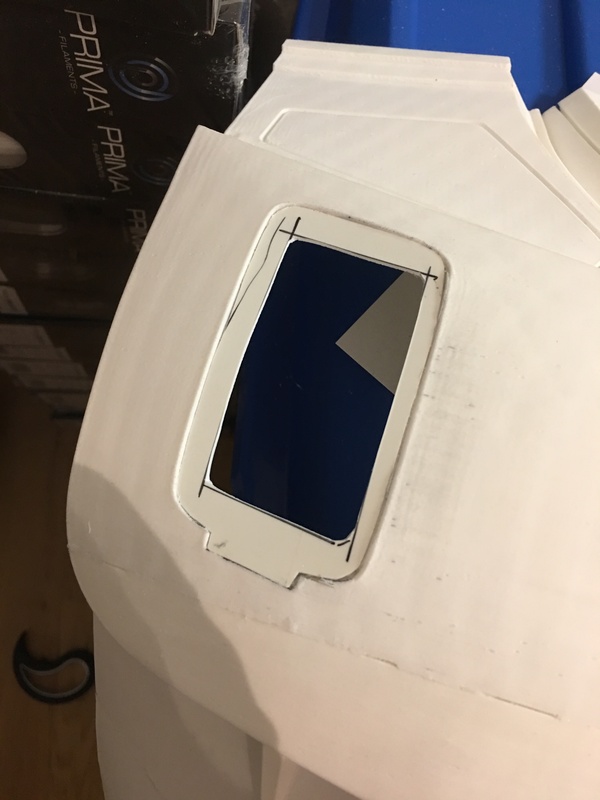 Pieces that all went in to the trash, and back to the base shape, make it thinner and add some studs in the joining parts. 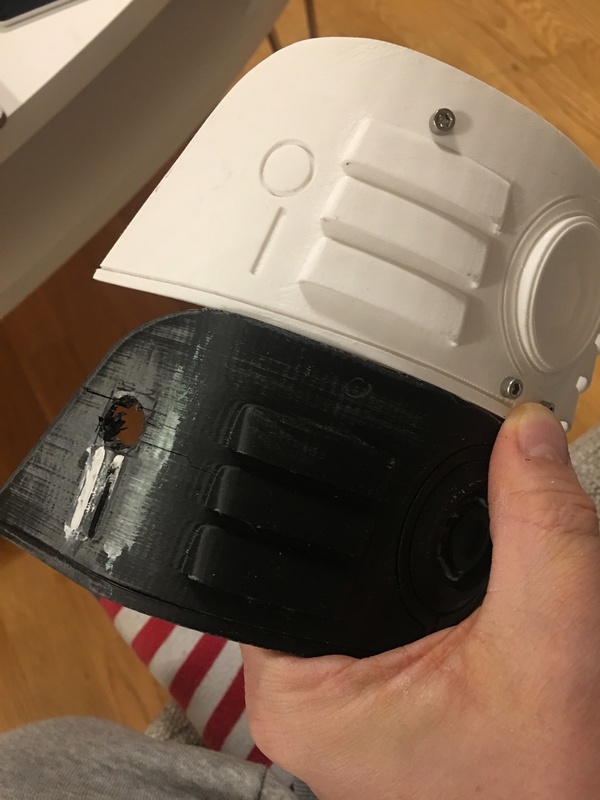 Next up is printing the helmet and the mask, but that will have to wait until I have upgraded my new printer (a CR-10s4) with a new extruder and hot end (Titan Aero with Volcano Hot End). 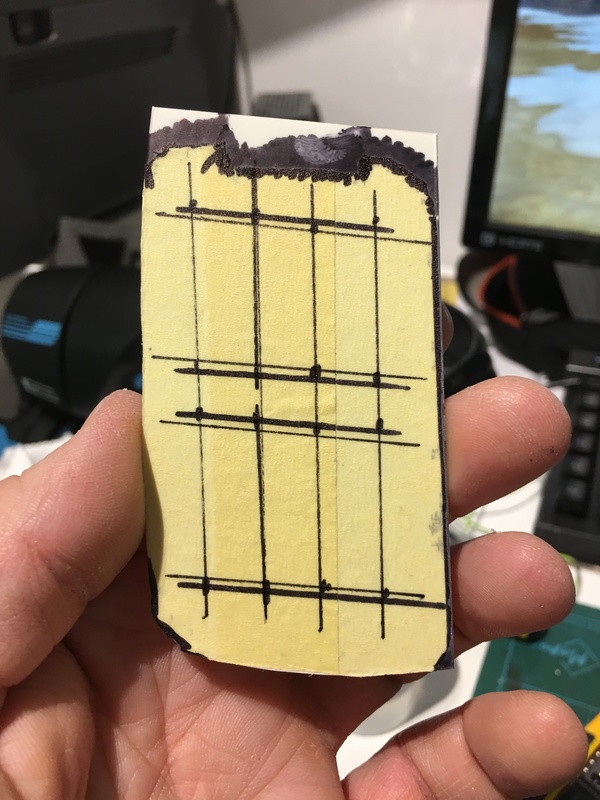 This should make the printing both faster and sturdier. 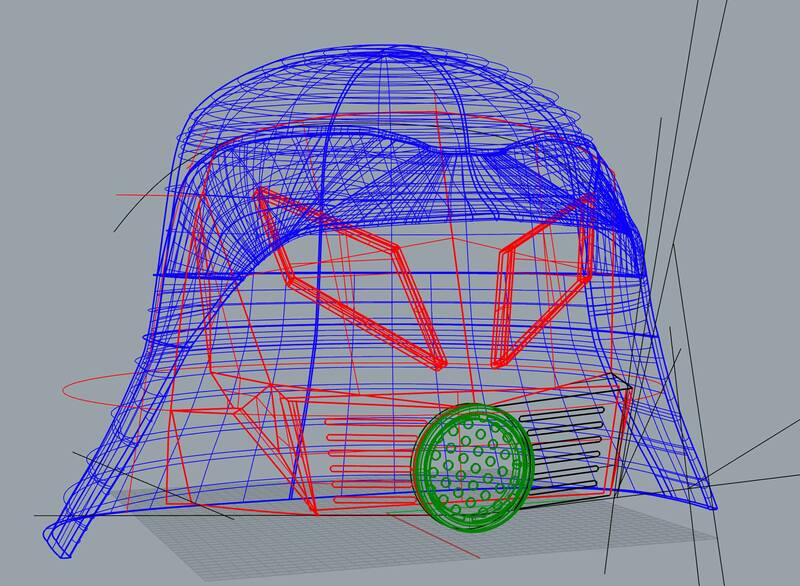 The helmet will be printed in PLA, and I have not yet decided if I should try and have a vacuuformed bucket pulled from it or not. 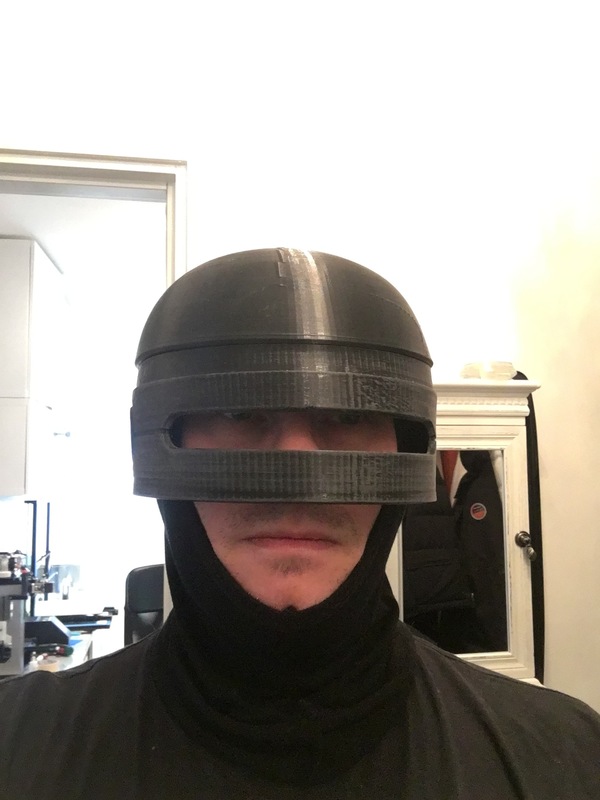 I tested the new design of the helmet and mask on a 3d scanned bust I made of myself. Looks pretty good, I think. All 3d elements designed by me in Rhino3d for Mac. Renders done in Maxwell Render. By micke|2018-02-21T16:57:35+00:00February 21st, 2018|Costuming, Dark Helmet|Comments Off on Ludicrous speed GO! For 2018, I have set up two costumes that I am going to build. 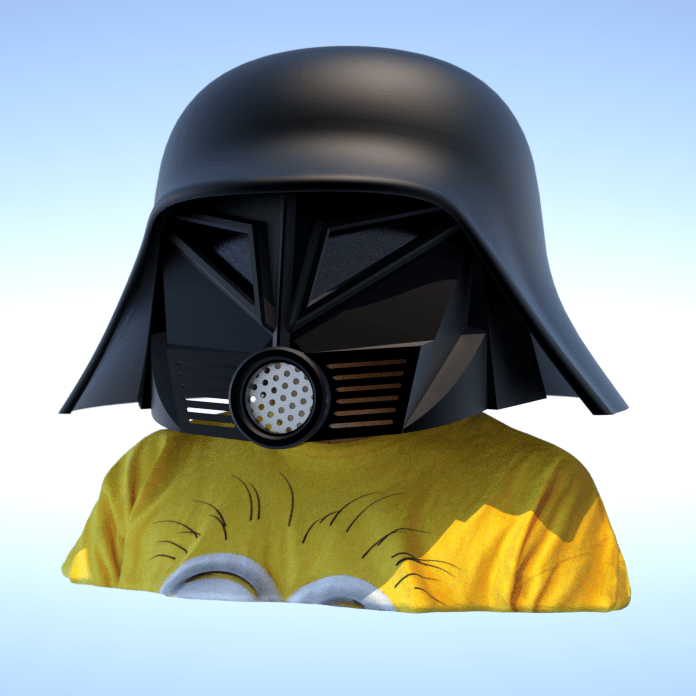 For yeas I’ve wanted to make a Darth Vader, but as I am 5 foot 10 (176 cm for those of you who like me use an understandable system of measurements), I am way too short to make one and be believable. There are no lifts in the world big enough for me to make this work. 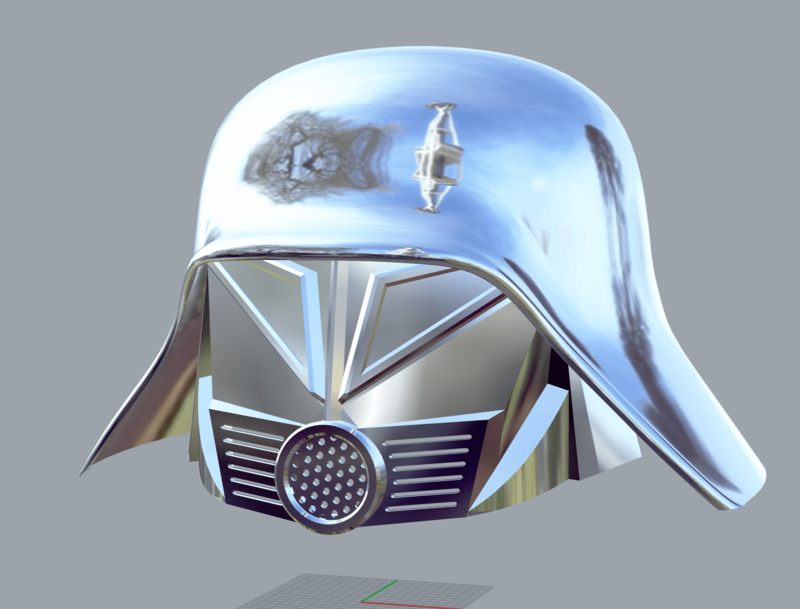 I searched the web for a good helmet but found none, so I ended up modelling my own from screen shots and reference pictures. The second costume is a dream costume that I will take my time on. 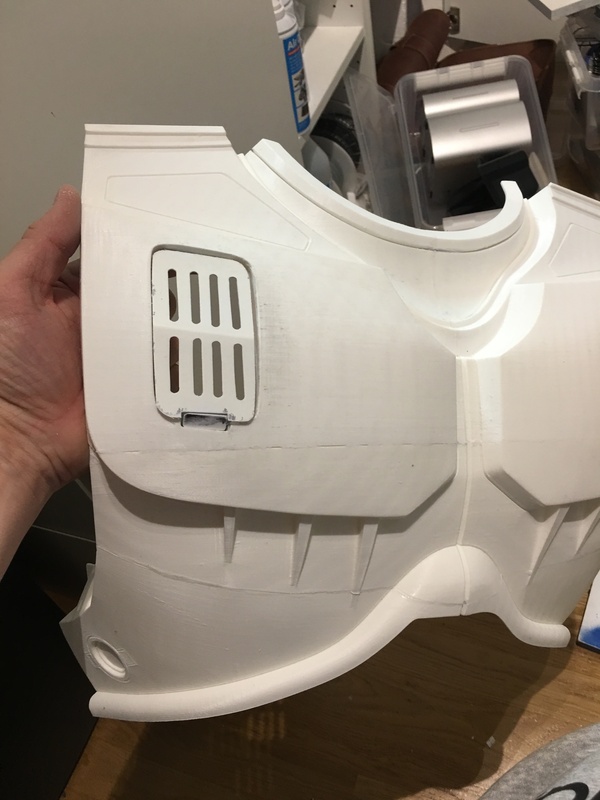 I decided to splurge and buy the 3d printable wearable Robocop armour from do3d. 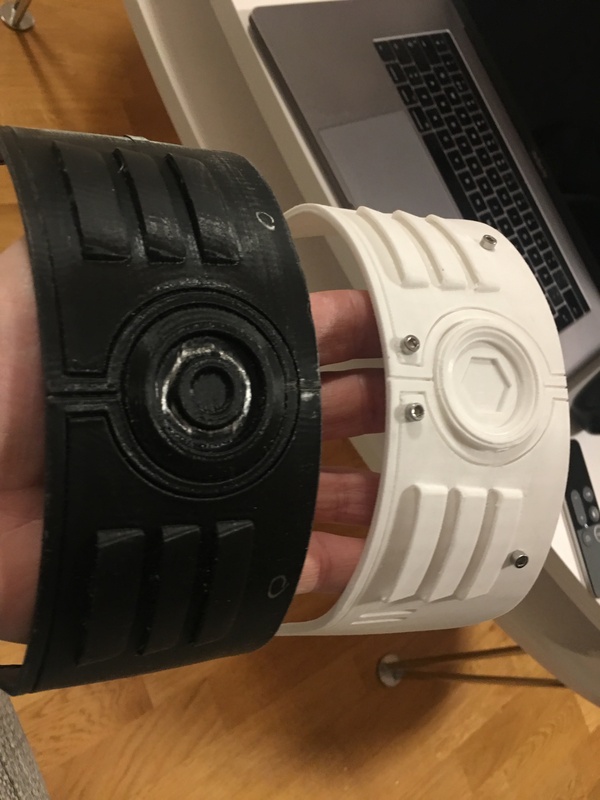 It is a good start, but it has a lot of modifications that needs to be done in order to make it wearable and make it screen accurate. I will of course go for accuracy here. These two sections will be added to this site, and stay tuned!